Thank you for your interest in becoming a member of the South Florida Banking Institute (SFBI). The SFBI currently accepts membership requests from financial institutions with a presence in south Florida as well as non-financial service companies that provide products and services to financial institutions in south Florida. Please complete the information requested below and one of our board members will follow up shortly. Thank you for your interest in becoming a member of the South Florida Banking Institute (SFBI). 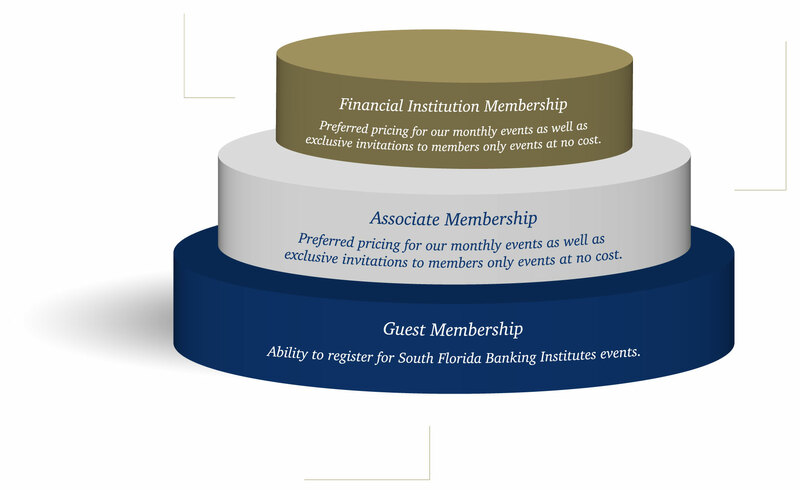 Under the Financial Institution Membership plan, the SFBI currently accepts membership requests from financial institutions throughout South Florida. Membership includes: Preferred pricing for our monthly events as well as exclusive invitations to members only events at no cost. Once you have submitted a request to become a member of SFBI, there is a process that takes place. First, the board will vote on your membership and, if approved, you will receive an email with further instructions on how to pay. If your financial institution is already a member, just fill out this form and your financial institution’s admin will be notified for their approval. If your company provides products and services to financial institutions, please use the Associate Membership plan. Thank you for your interest in becoming a member of the South Florida Banking Institute (SFBI). Under the Associate Member plan, the SFBI currently accepts membership requests from non-financial service companies that provide products and services to financial institutions in south Florida. If you are a financial institution, please use the Financial Institution Membership plan. New Subscriber Signup: Please complete the information below to be added to the SFBI mailing list as well as to be able to register for our events. Guest subscribers do not receive discounts on events. Once you have submitted a request to become a member of SFBI, one of our admins will review your application and, if approved, you will receive an email with further instructions on how to proceed. If your bank or company is already a member, please use the Financial Institution or Associate Membership plan signup form. Be Part of Something Special… Showcase your services at our next networking event!